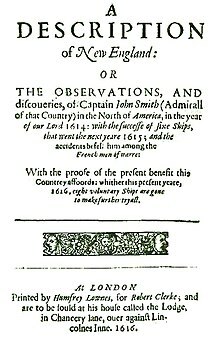 John Smith (c. January 1580 – 21 June 1631) was a English soldier, explorer, and author. 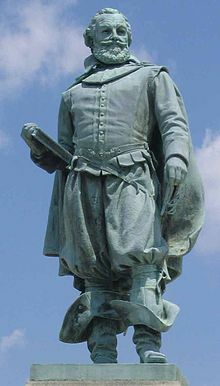 Smith was a leader of the first settlements at the Virginia Colony in 1608-1609. He explored the rivers of Virginia and the Chesapeake Bay and drew a map of the Chesapeake Bay area and New England. Smith's books and maps were very important in supporting Englishmen living in the New World. He wrote, "Here every man may be master and owner of his own labour and land and if he has nothing but his hands, he may still grow rich." At Jamestown Smith trained the people to farm and work so they would have food to eat. He told them "he who shall not work, shall not eat." Smith's strength of character and his determination overcame many problems including the harsh weather, lack of water, living in a wilderness, with people who did not want to work, and attacks from the Powhatan Indian tribes. Smith was born in January 1580 at Willoughby, Lincolnshire where his parents rented a farm. He claimed descent from the ancient Smith family of Cuerdley. Smith left home at the age of 16 and went to sea. He served as a soldier in the army of Henry IV of France against the Spaniards, fought for Dutch revolt from the Spanish King Philip II of Spain. He went to the Mediterranean Sea where he worked in both trade and piracy. He then fought against the Ottoman Empire in the Ottoman wars and for the Austrian Habsburgs in Kingdom of Hungary in 1600 and 1601. Smith is reputed to have defeated, killed and beheaded Turkish commanders in 3 duels. He was knighted by the Transylvanian Prince and was given a horse and coat of arms showing 3 Turks' heads. In 1602 he was wounded in a skirmish, captured and sold as a slave. Smith wrote that his Turkish master sent him as a gift to his Greek mistress in Constantinople, who fell in love with Smith. He then escaped from the Ottoman lands and returned to England in 1604. In 1606 the Smith was hired by the Virginia Company to settle in Virginia Colony for profit. They set sail in three ships, in December 1606. Smith had a servant named Samuel Collier. There were problems on the voyage and Smith was charged with mutiny. Captain Newport planned to execute him. The Captain opened a letter of orders from the Virginia Company which stated that Smith was to be one of the leaders of the new colony, so Smith was not killed. The English arrived in April 1607 and Captain Wingfield chose Jamestown to be the location for the colony. In summer the settlers were still living in temporary housing. After the four-month ocean trip, food supplies were only enough for each person to have a cup or two of grain-meal per day. Due to the weather and lack of food disease spread through the people and by September, more than half died. In April 1608 a ship brought supplies and 50 new settlers, whom Smith set to build housing and to plant crops. In the summer of 1608, Smith left Jamestown to explore the Chesapeake Bay region and search for badly needed food. He made a map that would be of great value to Virginia explorers for over a century. In his absence, Smith left his friend Matthew Scrivener, as governor in his place. Scrivener would later drown in a storm in an ill-fated voyage to Hog Island. Smith was elected president of the local council in September 1608 and instituted strict rules. In October 1608, a ship arrived with 70 new settlers, including the first women. Some German and Polish craftsmen also arrived, but they brought no food supplies. After that, Smith tried to get food from the Native Americans and it took threats of military force for them to obey. Powhatan was frightened by the great number of white men coming into the area and was trying to starve them. For three months in early 1609, February, March and April all was well at Jamestown with many dwellings built, acres of land cleared and much other work done. Then in April, rats and dampness destroyed all their stored corn. They needed food badly and Smith sent a large group of settlers to fish and others to gather shellfish downriver. They came back without food and were willing enough to take the meager rations offered them. This angered Smith and he ordered them to trade their guns and tools for fruit from the Indians and ordered everyone to work or they would have to leave the safety of the fort. 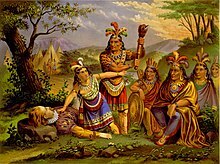 Some left and went to the Native American villages, but Powhatan’s people also went by Smith’s law that he who works not, eats not. This was in effect until they were near starved and they returned home. At some point an unexpected ship arrived, captained by Samuel Argall. He had food and wine which Smith bought with a promise to pay back. Argall also brought news that the Virginia Company was sending more supplies and settlers to Jamestown along with a new governor, Lord De la Warr. 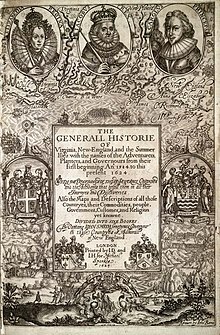 In a May 1609 voyage to Virginia, Sir Thomas Smith, Virginia Company treasurer, arranged for about 500 colonists, including women and children to come along. A fleet of nine ships set sail. One sank in a storm soon after leaving the harbor. The Sea Venture was shipwrecked on the Bermuda islands with the admiral and Stephen Hopkins on board. One year later, in May 1610, they had arrived at Jamestown in small boats they had made. Gates soon found that there was not enough food to support all in the colony and decided to abandon Jamestown. As their boats were leaving the Jamestown area, they met a ship carrying the new governor, Lord De la Warr, who ordered them back to Jamestown. In August 1609 John Smith was quite surprised to see more than 300 new settlers arrive. London was sending new settlers with no planning as to how or where they would live. Capt. John Smith was severely injured by an accidental gunpowder explosion in his canoe. Smith sailed to England for treatment in October 1609. He had spent two and a half years trying to do his best for Jamestown. He never returned to Virginia. History has confirmed his great contribution at Jamestown in its earliest years. Colonists would continue to die from various illnesses and disease, with an estimated 150 of the 500 surviving that winter. In spite of this, the Virginia Company continued to finance and transport settlers to sustain Jamestown. For the next five years, Governors Gates and Sir Thomas Dale continued to keep strict discipline, with Sir Thomas Smith in London attempting to find skilled craftsmen and other settlers to send to Jamestown. In 1614, Smith returned to the northeast coast of America and named the region "New England". In that same year a storm destroyed his ship. In 1615, Smith was captured by French pirates off the coast of the Azore Islands. He escaped after weeks of captivity and made his way back to England, where he wrote an account of his two voyages as A Description of New England. He never left England again. He died in the year 1631 in London at the age of 51. He is buried in the church of St Sepulchre-without-Newgate in the City of London. The Captain John Smith Monument currently lies off the coast of New Hampshire on Star Island, part of the Isles of Shoals. Built in 1864 to honor the 250th anniversary of John Smith's visit to what he named Smith's Isles. In 1914, the New Hampshire Society of Colonial Wars partially restored and rededicated the monument for the 300th anniversary celebration of his historic visit. The monument had weathered so badly in the harsh coastal winters that the words carved in the granite had worn away. ↑ 2.0 2.1 2.2 Snell 1974, Ch. 4. ↑ "History of the School". King Edward VI Grammar School, Louth. Retrieved 21 June 2008. ↑ 9.0 9.1 9.2 Snell 1974, p. 84, Ch. 4. ↑ Smith. Letter to Queen Anne. ↑ 12.0 12.1 Snell 1974, p. 83, Ch. 4. Snell, T Loftin (1974). The wild shores: America's beginnings. Washington DC: National Geographic Society (U.S.), Special Publications Division. Smith, John. 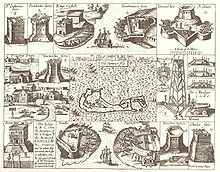 The Generall Historie of Virginia, New-England, and the Summer Isles. 1624. Repr. in Jamestown Narratives, ed. Edward Wright Haile. Champlain, VA: Roundhouse, 1998. pp. 198–9, 259. Smith, John. Letter to Queen Anne. 1616. Repr. as 'John Smith's Letter to Queen Anne regarding Pocahontas'. Caleb Johnson's Mayflower Web Pages. 1997. Accessed 23 April 2006. Wikimedia Commons has media related to Captain John Smith. This page was last changed on 26 September 2018, at 13:18.